4. Iris Linnaeus, Sp. Pl. 1: 38. 1753; Gen. Pl. ed. 5, 24. 1754. Herbs, perennial, from rhizomes [bulbs or fascicles of fleshy roots]; rhizomes homogeneous with branches like primary in size and texture, or heterogeneous, branches cordlike with scalelike leaves, enlarging at apex to produce vegetative leaves, additional cordlike branches, and flowering stems. Flowering stems simple or branched, erect (declining or semierect and obviously zigzag in I. brevicaulis and some of its hybrids), solid or hollow, terete or slightly flattened. Leaves: basal 3–10, in fan; blade monofacial (except at base), smooth or ridged, sometimes centrally thickened, veins obscure to prominent; cauline 0–4 on branched stems, usually similar to basal, subtending each branch, decreasing in length distally, sometimes bracteiform and sheathing stem. Inflorescences rhipidiate, units 1 or more-flowered, spathaceous; spathes 2, herbaceous with scarious tips, or completely scarious, with or without distinct keel, often persisting and enclosing capsule(s) at maturity. Flowers lasting 1–4 days, upward-facing, usually somewhat fragrant (odor extremely unpleasant in I. foetidissima), pedicellate or sessile; perianth epigynous, white, yellow, tan, brown, copper-red, maroon, blue, blue-violet, or purple, often with markings of contrasting colors, differentiated into sepals and petals, actinomorphic, 4–18 cm diam. ; floral tube distal to ovary, terete or occasionally ridged, solid proximally, hollow distally; sepals 3, spreading or reflexed, expanding either gradually or abruptly from claw into broader limb, with signal of prominent ridge, crest, distinct lines or dots, pubescence, or band of multicellular hairs (beard) along midline of claw and for short distance along midrib of limb; petals 3, erect, spreading or rarely reflexed, sometimes very reduced and mostly hidden by sepal bases; stamens opposite sepals, free but appressed to style branches; style dividing distally into petaloid branches, these arching outward and over stamens and claws of sepals, dividing at apex into 2 rounded or triangular lobes (style crests); stigma a lip of tissue on adaxial surface of style arm at base of crest; ovary terete or roundly 3- or 6-angled or -grooved. Fruits capsular, wall papery or becoming dry and hardened, sometimes indehiscent (in I. giganticaerulea). Seeds 4–20, in 1–2 rows per locule, often flattened in contact with others, rounded on outer surface; seed coat tan to dark brown (red in I. foetidissima), thin, membranous, and smooth, or conspicuously roughened to extensively corky (usually in wetland species), with or without obvious aril. x = uncertain. Species ca. 280 (34 in the flora): Northern Hemisphere. Because irises have large, handsome flowers, have many different forms, colors, and color patterns, and are easily grown and propagated, they have become popular garden ornamentals. Many non-native irises may be found in the flora area, not only in specialized gardens, but in casual plantings and persisting around old dwellings, in cemeteries, and along roadsides. These include not only the more common bearded irises, but members of the Sibirian, Spuria, Japanese, and Dutch groups. In the Pacific Coast and southeastern areas of the flora, repeated hybridization, both natural and artificial, of some of the local species has produced hundreds of garden forms that have added greatly to the popularity of this genus. Asexual reproduction in many Iris species may be more important than sexual reproduction in their persistence, and many hybrid clones may persist for decades in sites no longer cultivated. 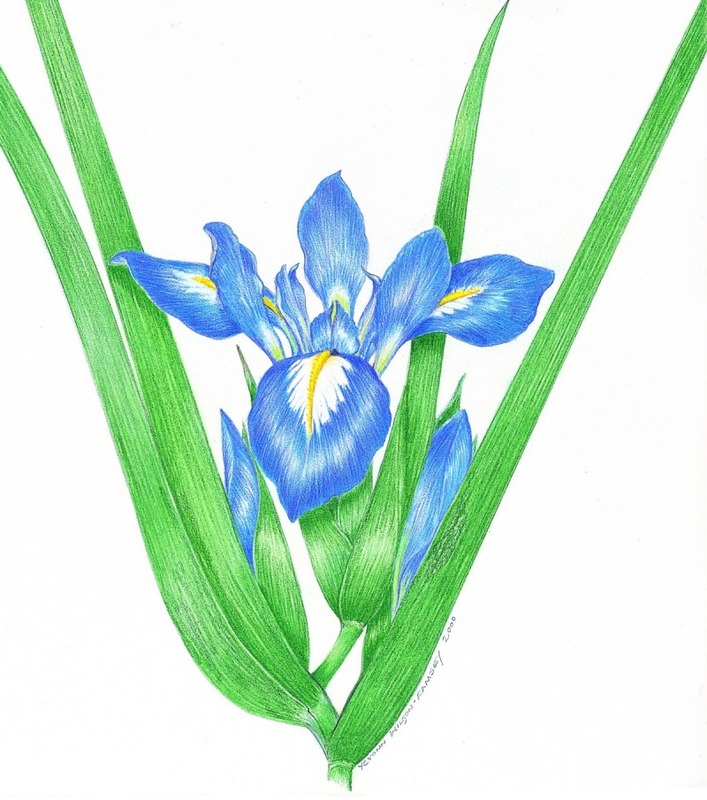 The species of Iris differ from members of other native genera of the Iridaceae in North America in three ways: 1) the sets of outer and inner perianth members (sepals and petals herein) differ from each other in shape, orientation, and, in some cases, coloration; 2) the parts of the flowers—petals, sepals, stamens, and styles—are united basally into a floral tube that surmounts the ovary; and 3) the styles are petaloid and modified with some specialized structures to insure cross pollination. T. Holm (1929) restricted the term rhizome to a horizontal, usually subterranean, stem that produces roots from its lower surface and green leaves from its apex, developed directly from the plumule of the embryo. He recognized stolons as axillary, subterranean branches that do not bear green leaves but only membranaceous, scalelike ones. The rhizomes of Iris are of two basic kinds: homogeneous, with the branches like the primary one in size and texture, and heterogeneous, with the branches of the primary rhizome like stolons with scalelike leaves. These enlarge at the apex to produce green leaves and more stolonlike branches. According to B. Mathew (1990), Iris includes six subgenera. Species of subgenera Iris and Limniris are rhizomatous; the others are either bulbous or perennial from a fascicle of fleshy roots. Three species of subg. Iris are sometimes found naturalized from cultivation in the flora area. Other species of the subgenus are found here only in cultivation or as waifs. The native North American species of Iris all belong to subg. Limniris, usually referred to as the beardless irises. The four other subgenera, which are found in the flora area only in cultivation or as waifs, have all been recognized sometimes as separate genera: subg. Nepalensis (Dykes) Lawrence as Junopsis Schulze; subg. Xiphium (Miller) Spach as Xiphion Miller; subg. Scorpiris Spach as Juno Trattinnick; and subg. Hermodactyloides Spach as Iridodictyum Rodionenko. F. Köhlein (1987) accepted these four segregate genera; however, most current authors circumscribe Iris in the broad sense, as here. Elevation is unimportant in the taxonomy and ecology of Iris, and very rarely is it recorded on specimen labels. Consequently, elevations are not reported in the species treatments that follow. Anderson, E. 1936. The species problem in Iris. Ann. Missouri Bot. Gard. 23: 457–509. British Iris Society. 1997. A Guide to Species Irises: Their Identification and Cultivation. Cambridge and New York. Dykes, W. R. 1913. The Genus Iris. Cambridge. Foster, M. 1889. On irises. J. Roy. Hort. Soc. 11: 131–149. Foster, R. C. 1937. A cytotaxonomic survey of the North American species of Iris. Contr. Gray Herb. 119: 3–79. Henderson, N. C. 1991. Iris ×pacifica. Bull. Amer. Iris Soc. 280: 85–87. Henderson, N. C. 1994. The Louisiana irises. Bull. Amer. Iris Soc. 293: 73–82. Köhlein, F. 1987. Iris, transl. M. C. Peters. Portland. Mathew, B. 1990. The Iris, rev. ed. Portland. Wister, J. C. 1927. The Iris: A Treatise on the History, Development and Culture of the Iris for the Amateur Gardener. New York and London.